Color and color patterns provide indications of mineral and organic content, as well as moisture levels, in soils. Soil color is an indication of nutrient content. The Munsell system provides a standardized reference for determining soil hue, intensity and darkness. Soil patterns, or mottling, are examined to determine water content and the level of water that was in soil from previous seasons. Humus is the stabilized particles of highly decomposed organic matter. Deep brown in color, humus forms over several years and provides nutrients and soil structure for plant growth. Humus should comprise about 50 percent of garden soil for optimal growth. Soils high in humus and decomposing organic matter are dark brown to black. Humus is dark in color because it has a high mineral content; it can also absorb and drain water. The top two layers of soil are usually highest in organic matter and are darker than lower levels. Clay soils are yellow to red. Clay has very small particles that stick together. The particles attach easily to iron, manganese and other minerals. These minerals create the color in clay. Clay soils absorb water, but have poor drainage. Plant roots can be deprived of oxygen from water-laden clay soils. Add organic matter and sand to the soil to improve soil structure for plant growth. Soils high in sand are light gray to white. Sandy soils are devoid of most minerals that lend color to the soil. Sand has large, coarse particles that do not stick together. This soil structure allows water to drain easily, but it also allows nutrients to leach from the soil. 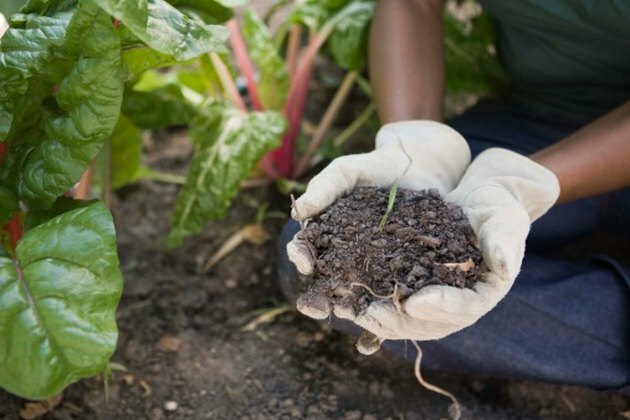 Add organic matter to the garden to improve sandy soil. Soils that have higher water holding capacity are darker in color than sandy soils. Silt soils are beige to black. Silt particles are smaller than sand particles and bigger than clay particles. Though silt has a high mineral composition, predominately quartz, it does not have water holding capacity and must be combined with other soils to be of benefit in the garden. Silt has the texture of talcum powder and can be washed away in heavy rains. Add organic matter to silt to add weight and improve its water holding capacity. What's the Permeability of Various Soil Types?